Description Of Item: Bow? may be an expert marksman, but he?s no Cupid -- all the magic arrows in the world wont deliver him his one true love, Adora. The first and only male character from the Princess of Power? series to be created in scale with all other Masters of the Universe? 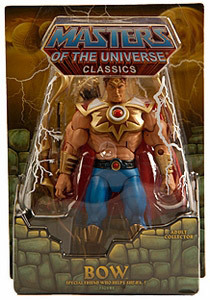 Classics figures has been completely re-imagined by the Four Horsemen, including ?bowman?s wrist? articulation so he can properly hold his bow and arrow. Although he does come complete with the following accessories, he is still without the key to his Princess?s heart.